Thinking “outside the box” cannot be underrated. There is no advancement without it. The greatest inventive minds throughout history were those able to imagine in the most creative, resourceful ways. 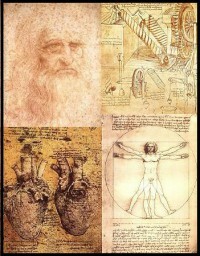 A man who, in my opinion, is the epitome of inventiveness was none other than Leonardo DaVinci. My “innovation” icon combines* his self-portrait with several images depicting his innovative mind and obviously insatiable curiosity.